When we think of social media, Twitter, Facebook and Instagram are probably the first platforms that come to mind. After all, these are the major platforms leading the way and generating headlines (although not always for the right reasons). However, LinkedIn has been quietly building a strong presence and reputation within the professional community. Over the last 15 years, LinkedIn has grown rapidly to create a network of over 560 million professionals worldwide, with 23 million in the UK. With more advanced audience targeting, new ad formats and conversion tracking, LinkedIn has become a very valuable ad tool for B2B marketers. The data LinkedIn has gathered on professionals from sectors all over the world give brands a unique opportunity to reach and engage individuals with different levels of influence. Within this post, I’m going to highlight some of the key steps to advertising on LinkedIn. Unlike many of the larger social networks, LinkedIn still gives brands the opportunity to achieve a good level of organic reach (20-40%) with followers. So before jumping into using paid advertising, it’s worth investing some time into developing your organic presence. The goal is to continually test and optimize organic content to ensure you’re investing in the highest performing content for your paid campaigns. 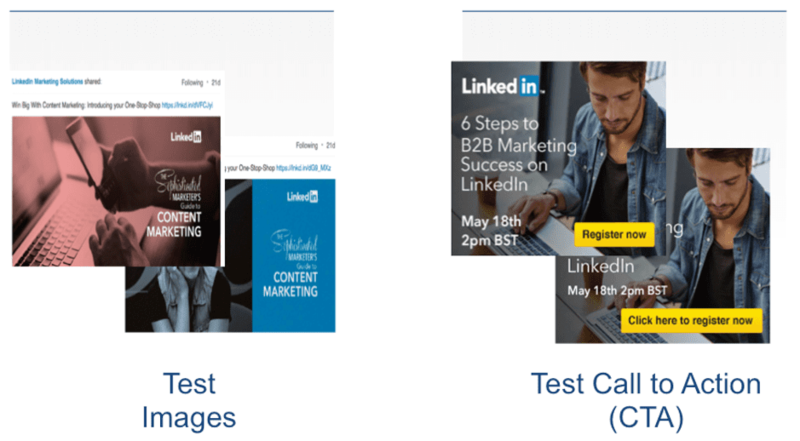 Check out LinkedIn’s page playbook, which provides a detailed, step-by-step guide to creating a really top-performing corporate page. 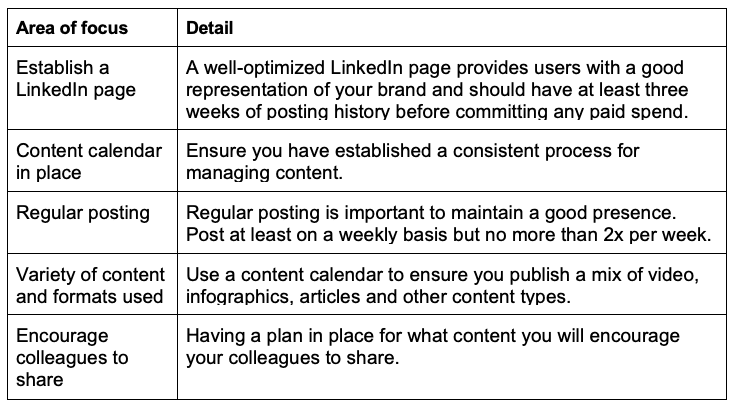 LinkedIn’s paid media options can be divided into two main groups. The choice you make depends entirely on the objective you’re looking to meet. It’s important to ensure that the strategy you devise ladders back up to these objectives as this will ultimately influence the content you create. 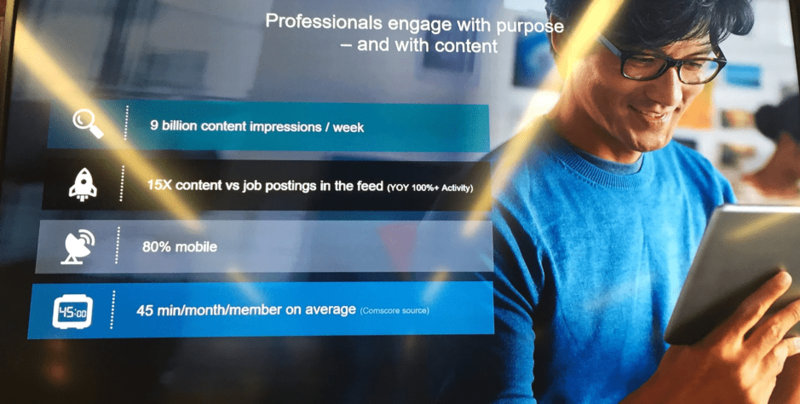 LinkedIn’s sponsored content options give you the opportunity to deliver content directly into your target audience's news feeds. Sponsored content is a great way to expand your reach beyond what you are already achieving organically. Depending on your objective, you can create a full-funnel campaign, serving top-of-funnel content to generate brand awareness with bottom-of-funnel content to drive leads. 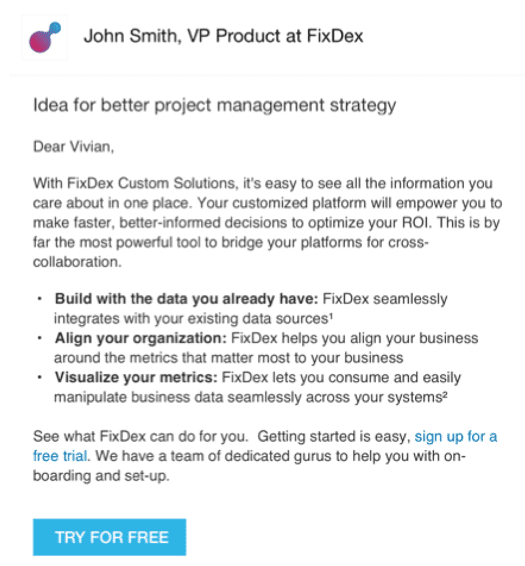 Sponsored InMail gives you the opportunity to create personalized messaging for specific groups of people. 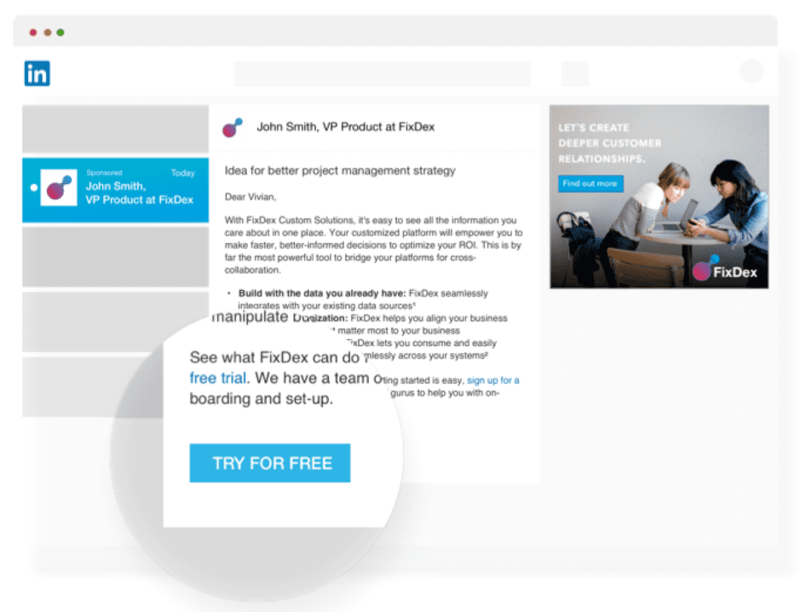 Whilst this tactic could be seen as intrusive, if executed well alongside supporting sponsored content, this tactic can help drive higher quality leads. Lead Gen forms can be used as part of both sponsored content and sponsored InMails. Lead Gen Forms add a call-to-action aligned to your objective, e.g. 'download', 'sign-up', 'follow'. When users click the CTA they’ll see a sign-up form within the app. Instead of filling out different fields, LinkedIn will automatically populate details from their account creating a frictionless experience for users. Once you’ve reviewed and selected your chosen range of options, the next stage is to put this all into practice. While I recommend testing and learning, always follow the correct best practices or 'brilliant basics' to ensure you’re seeing the best results. Always start broad, learn and then focus on the audiences that are more likely to engage. 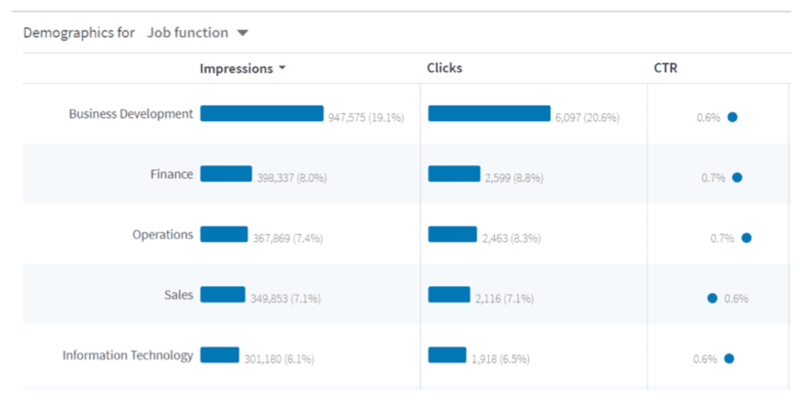 Use this tool to see what aspects of your targeting is working and optimize accordingly. Focus on audiences more likely to engage to maximize the chances of success. You can filter out demographic information by a number of different targeting elements, including job function, job title, seniority etc. so you can identify your targeting sweet spot. When you go live, ensure you have at least three to five creatives running concurrently. Continually test to identify opportunities to improve performance. You have the ability to test multiple different elements, although it’s important to only test one thing at a time, e.g. change an image or the text, but not both at the same time. Otherwise, you won’t know for sure which change made an impact. A culture of testing will help you define a unique blueprint for each audience - what they respond to and what they don’t. Videos autoplay with no sound and 80% of videos are watched without sound. 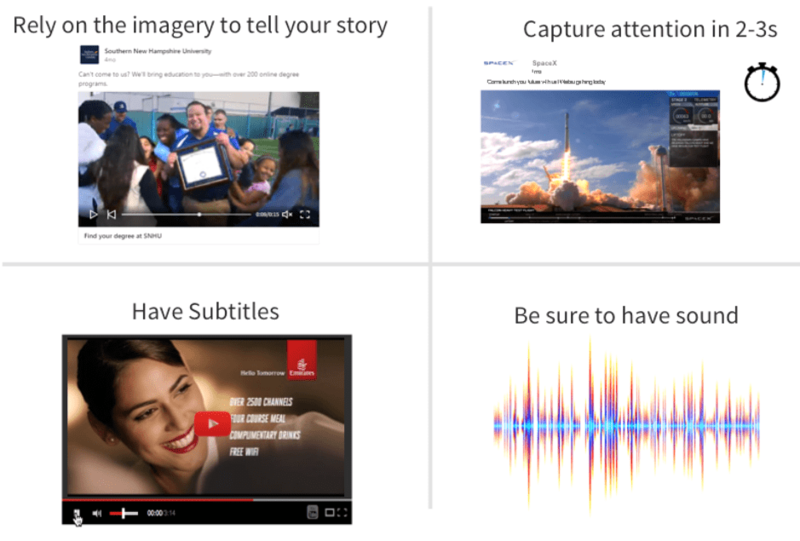 So, by all means, include sound in your content, but ensure that you tell a story that is led by imagery. Videos designed with the sound off resulted in a 70% increase in completion rates. Advertisers gained 37% higher sponsored InMail click-through rates when running sponsored content to the same audience on the same day. 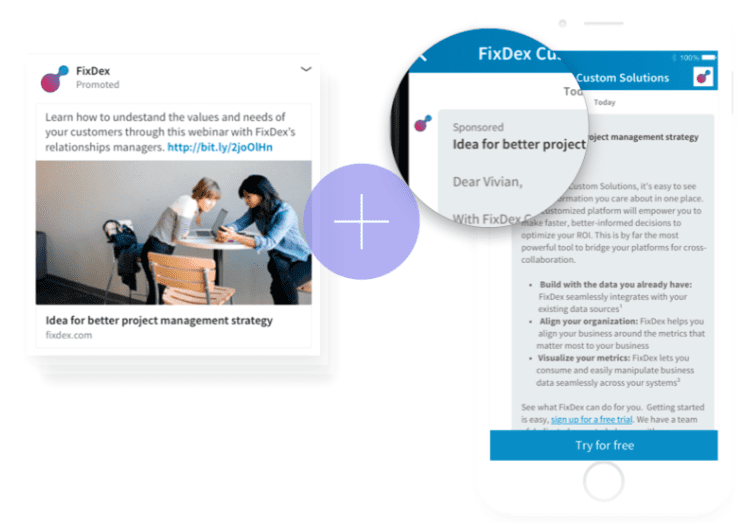 Running sponsored content in parallel with InMails gives you ‘air cover’ and primes your audience in advance of receiving personalized direct messages. Interestingly, calls-to-action should contain either one or three words (nothing in-between). CTAs with one or three words have 13% higher click-through rates. Being concise, personal and relevant achieves better results. Body texts under 500 characters has a 46% higher CTR. Only ask for info you need. Forms with four fields have the highest form completion rates. Use your form to provide the answer and solution. Disarm people by telling them in the form that your content is free. No obligation required. Link to more posts or content so people can continue to engage with you even after filling out your form. Ensure you’re constantly testing your Lead Gen forms. The smallest change could have a disproportionately large impact. LinkedIn is a social platform certainly worth considering if you’re a B2B brand looking to build authority in your area of expertise and reach an engaged, interested audience. Unlike consumer social networks, LinkedIn members are professional and have very specific objectives for using the site. 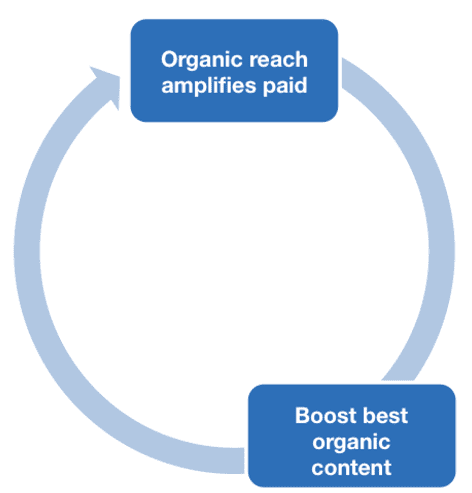 Use this to your advantage by building an organic presence before employing selected paid media to boost reach, engagement and conversions.